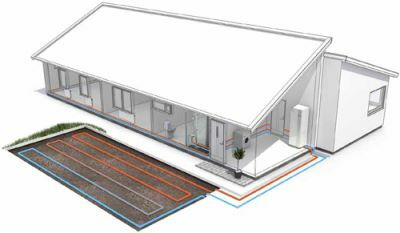 A geothermal heat pump or ground source heat pump is a central heating and cooling system. This system uses the earth as a heat reservoir to heat or cool buildings. They operate on the fact that the earth beneath the surface remains at a constant temperature throughout the year. The earth is used as a heat source (in the winter) and a heat sink (in the summer). Keltic Heating & Plumbing provide and install ground source or geothermal heat pumps from Danfoss. Danfoss have over 40 years experience in developing and supplying heat pumps for the European markets. The DHP-H Opti Pro+ represents the next generation in ground source heat pumps. Designed to provide excellent comfort with maximum reliability and cost efficiency. The DHP-H Opti Pro+ uses opti technology to continuously adjust its performance to suit your requirements and conditions. This means no unnecessary work, maximum efficiency and minimum energy consumption all the time. The high efficiency can result in a staggering reduction in your energy costs of up to 75%. The new TWS (Tap Water Stratification) technology producing hot water faster and at a higher temperature. 15% more hot water is provided than conventional methods. Reduce your heating bills by up to 75%. 15% more hot water delivered faster and at a lower cost than any other heat pump. Due to significant savings the investment cost is paid back in no time. The elegant design is ideally suited to match any location. Safety and control through online control any time and any where.